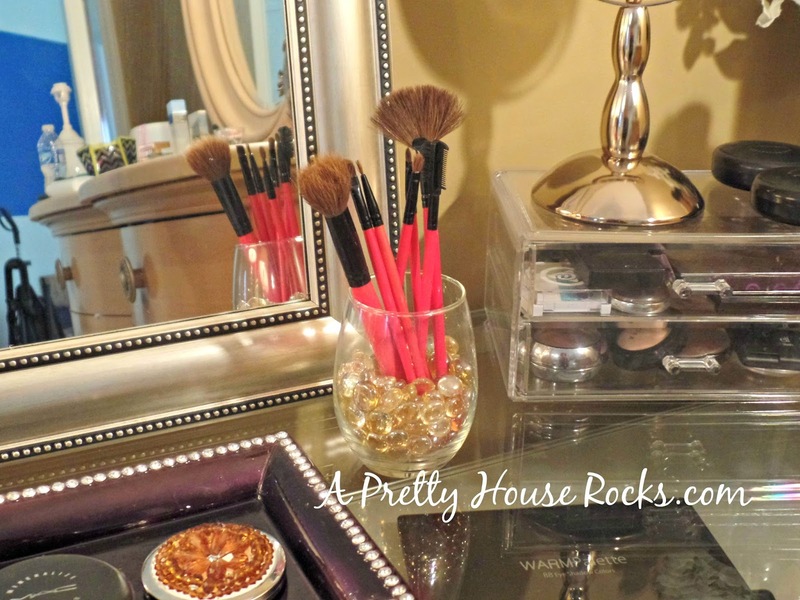 How to add a Make-up Vanity or even a Desk in your bedroom or any small space. Do you often feel like you want a dedicated space just for you? 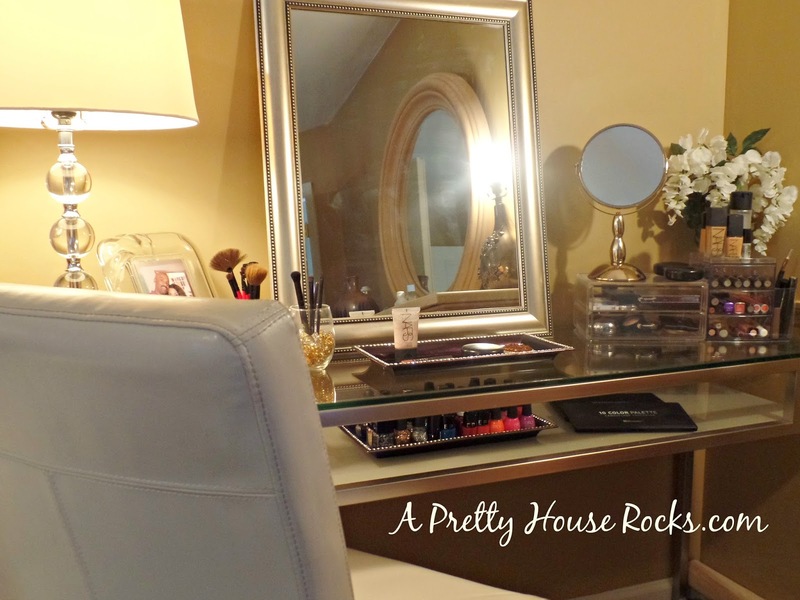 I must admit that I love make-up almost as much as I love decorating my home. 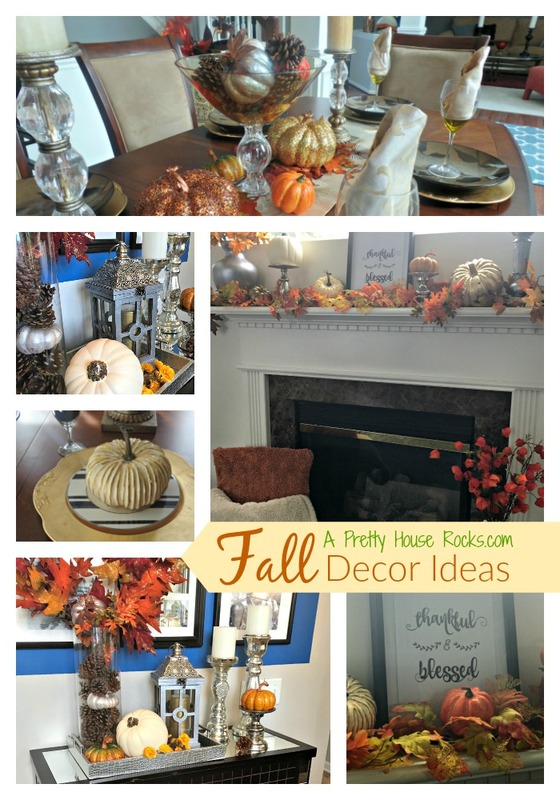 I love to pretty up my house....but what about me? Many of us are just too busy to sit down and do something personal. Doing my nails is hardly ever on my to-do list. Maybe I watch too much reality tv, but I love how celebrities always seem to have that special place to glam up. We should all be so lucky! 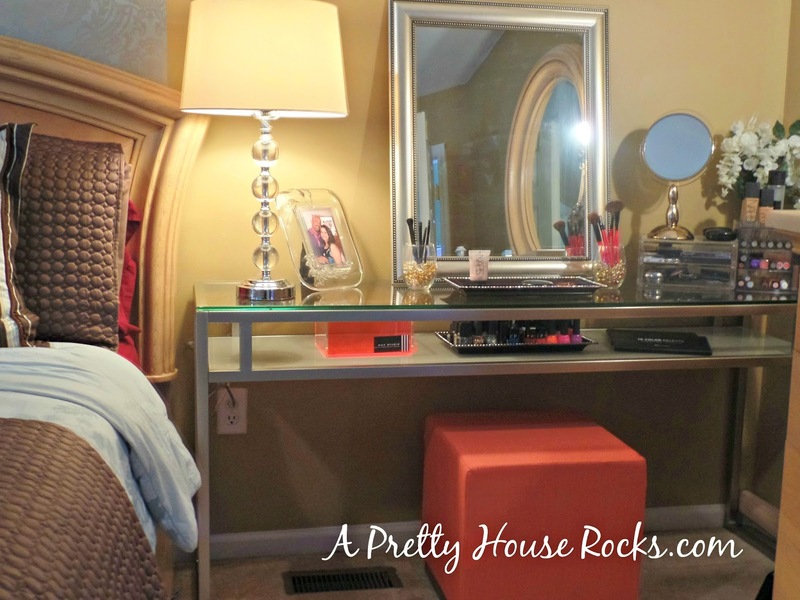 As many of you can attest, besides our busy schedules, the problem is that space for a fabulous make-up vanity is often limited. SOOOO....I decided to improvise. I relocated my night stand and I purchased this quite "expensive looking" console table from JCPennys. Its the Upton glass hall table. It is a combination of glass and chrome and looks amazing in real life! Since I'm always on a budget, so are all the accessories. I'd rather spin the money on the actual make-up I will be using at this vanity. I got the lamp and mirror form Walmart....shhhhh, don't tell anybody. The cream leather chair was from another room and it was a great buy from HomeGoods a year ago....my favorite store! You could even use an ottoman or stool instead of a chair to give your room a more spacious look. 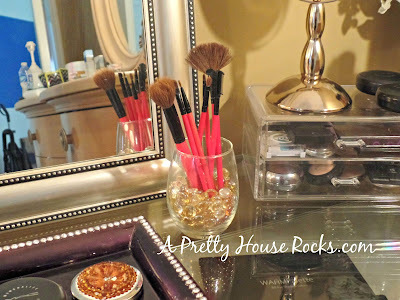 Glass cups from Target filled with gold glass marbles were the best way to display my make-up brushes. They also have nice glass bowls at the Dollar Store. I bought these acrylic cases and make-up mirror from TJ Maxx....another good buy. 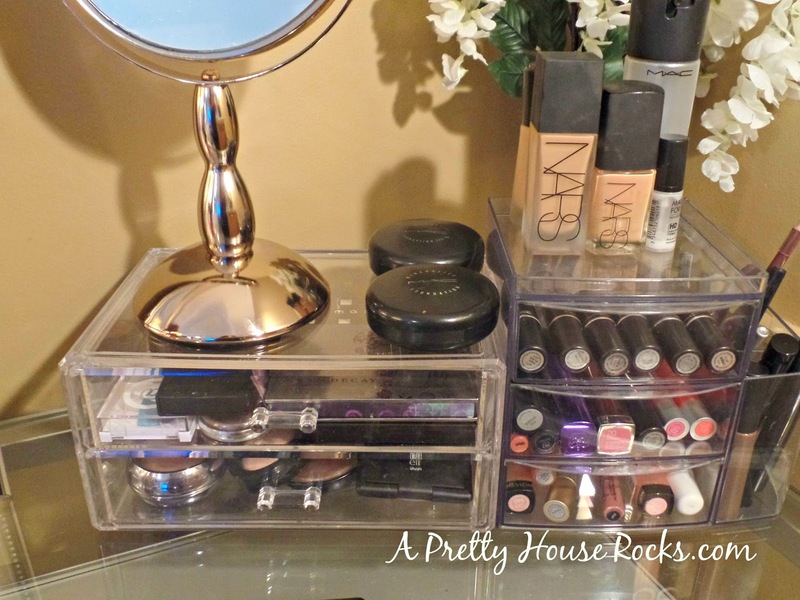 These acrylic cases are usually very expensive..
Let's say make-up isn't your thing or you simply need an additional work space. This table is great as an instant desk. 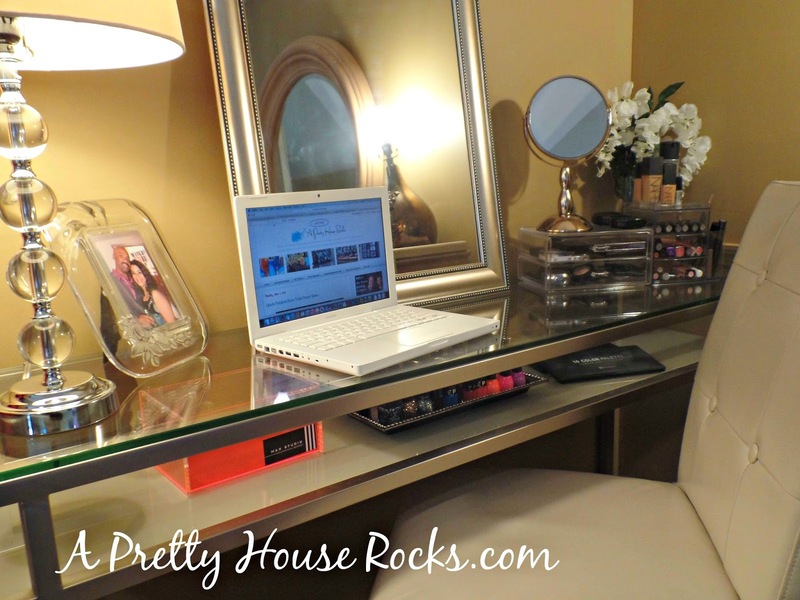 I hope these pics have inspired you in some way to glam up any space or add a bedroom workstation in your home. 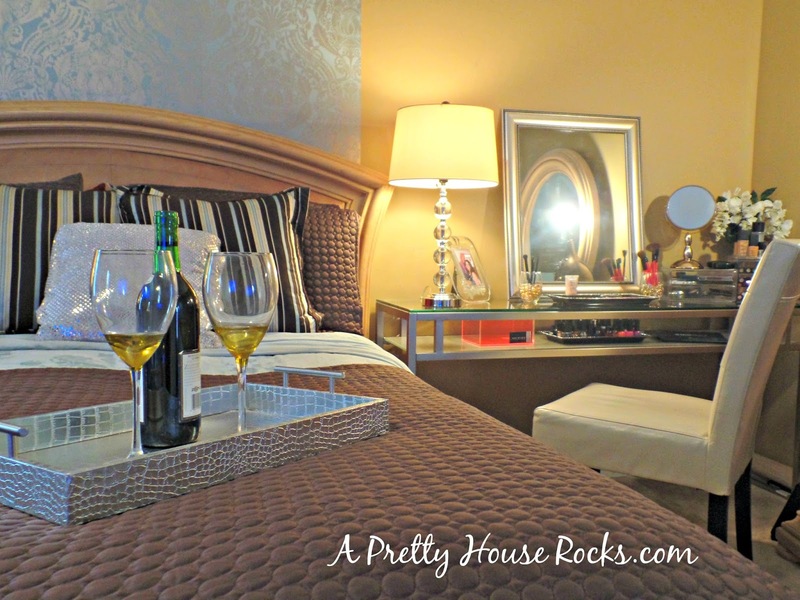 Thanks for visiting A Pretty House Rocks!